Stepanakert or Khankendi (Armenian: Ստեփանակերտ, Azerbaijani: Xankəndi) is a nice small city and the capital of unrecognized but de-facto independent republic of Nagorno-Karabakh. There is some dispute whether the first settlement in this area was started by Armenians in 5th century and thus was called Vararakn ("rapid spring" in Armenian) or by a Karabakh khan in 18th century, and was thus called Khankendi (Turkic for "the khan's village"). At any rate, the town was renamed in 1923 to Stepanakert to honor Stepan Shahumyan, ethnic Armenian leader. It also became the capital of the newly created Nagorno-Karabakh Autonomous Oblast. Shortly after that municipal authorities adopted a new city layout designed by the prominent Armenian architect Alexander Tamanian, which is still in use. During the war, the city suffered immense damage from Azeri bombardment which continued from 1992 to 1994. Armenian is the universal language, but Russian is spoken widely, and it may always be used for everyday contacts with locals. Older locals are likely to speak Azeri and therefore understand some Turkish. English is becoming more and more popular since most children now learn it at school. Be prepared that most children but also many younger adults want to improve their English and therefore try to engage you in English-language conversation while you walk around. This can be lot of fun and you are likely to get valuable information about accommodation or bus connections that way. In the ministries, there is always at least one person who can speak English fluently. If not, they call somebody. The same applies in larger shops like electronic markets or phone stores. Tourists must obtain a Nagorno-Karabakh visa. Tourist visa may be obtained in 10 minutes without bureaucratic formalities at the Official Mission of Nagorno-Karabakh Republic in Yerevan, or within 24 hours of arrival to Stepanakert at the Ministry of Foreign Affairs building. The overall best budget option to get to Stepanakert are 'marshrutki' (single: 'marshrutka') i.e. micro-buses which every morning go from the Kilikia bus station in Yerevan, Armenia to Stepanakert. Marshrutki are not especially comfortable but they are cheap (less than US$20, which you should pay in Armenian currency). Normally, marshrutki depart at 6:00, 7:00, and 08:00, sometimes at 09:00 but it is the approximate departure time. You should arrive some time (at least 20 minutes) before the departure to find a free chair. It might be that your luggage will be nested on the roof of the bus. There is at least one daily bus from Yerevan. The journey is slow and can take up to eight hours. Tickets cost currently 4,500 dram (March 2015). There is a bus connection with other Armenian cities of Vanadzor, Sisian, Goris (one marshrutka per day at 10:30 for 2,000 dram, takes about 2 hours) and all major Nagorno-Karabakh cities incl. Askeran (23 km), Berdzor (58 km), Hadrut (71 km), Karvachar (120 km), Martakert (69 km), Martuni (41 km), Shushi (13 km). Driving is also possible, and cars rented in Armenia can be driven to Karabakh and back without issues. The M-12 highway connects with Armenia via Goris and is the most common way to reach Stepanakert. A more adventurous traveler can opt to drive through the Karvajar pass via Vardenis which has been newly paved (2016). To reach the pass, follow road M-11 on the Armenian side. Both roads offers amazing views of wild life, deep forests, dramatic cliffs and several ancient monuments on the way. Few people speak anything other than Armenian and some Russian so prepare yourself with a dictionary. Hitchhiking is safe and common enough in the countryside. Offering a small sum for your ride is polite, though in most cases it won't be accepted. Since 1994 all train connections are suspended. There are several city bus lines. The price was 100 dram in March 2015. There are lots of taxis ranging from a very old cars to a brand new Mercedeses. Taxi prices are a bit higher than in Yerevan and increase if you leave the city for the countryside. Drivers tend to be honest, but using a meter is always a good idea. 39.81713146.7577211 Stepanakert Shuka (farmers market), Sasuntsi Tavit Street. Great selection of fresh and preserved fruits and vegetables, plus other supplies. You can try fresh jingalov hats here - a dish with wild mountain herbs that Karabakh is famous for. 39.83704646.7706472 We Are Our Mountains Monument (Tatik & Papik Monument). This monument of an elderly Karabakh man and woman has become the symbol of Artsakh. 39.81286346.7490283 St. Astvatsatsin (Holy Mother of God) Church. The new church built in 2007. You should also visit some government buildings and universities. 39.93333346.8316675 Askeran Fortress (Mairaberd), Askeran town (N 16 km). Fortress was built by Panahi Khan in the 18th century to guard the approaches to Shushi, it was fortified with double walls. Its protective walls (2 m thick and 9 m height), entrance gate and tower are quite well preserved. 40.06527846.9058336 Tigranakert. It's a ruined Armenian city dating back to the Hellenistic period. It is one of the four former cities with the same name, named in honor of the Armenian king Tigranes the Great (95–55 BC). Town consisted of 3 parts: part with palaces was at the top, then - central quarter, and Acropolis - at the bottom, all together forming a little triangle. There are many museums that show the history of the region. There are also a lot of parks, many of them are brand new with nice statues and memorials. People are very friendly and will be happy if your children play with their children. 39.80121946.7392311 Janapar Trailhead to Shushi. Janapar trail with trail markings leading to Shushi. 39.84482346.7550552 Janapar Trailhead to Patara. Marked Janapar Trail leading to Patara village. There are five schools of higher education in Stepanakert: Artsakh State University and four private universities. Artsakh State was established in 1969 as a branch of the Baku Pedagogical Institute. In 1973, it was renamed Stepanakert Pedagogical Institute and following the end of the war, in 1995, it received its current name. The university offers courses spread across seven departments and has an attendance level of 4,500. There are many souvenir shops. A very nice one can be found in the lobby of hotel "Armenia". 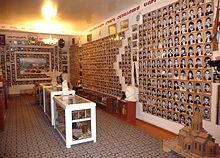 Stepanakert boasts of a number of art galleries and rug shops. There are so many cafes throughout the city. 39.81987546.7569271 Tashir Pizza, 20 Azatamartikneri St.. Western style place with pizza, salad and soup. Non-smoking section and wifi. 39.81778946.754262 Restaurant "Rosya". Upscale Russian restaurant. Stepanakert Shuka. Sample the many very strong vodkas (oghi) made from the local fruit. Mulberry vodka is the most famous, but apricot, pear, cornelian cherry and others are also delicious with a serious kick. 39.819646.7563721 Artsakh Alco. Shop with high quality local vodkas and drinks made from fruit. Nice packaging. Budget accommodation (about US$5) is easily available as there are many guest houses. Try to speak with locals about that or ask marshrutka driver which drove you to Stepanakert. 39.81835146.7495241 Hotel "Armenia", 20th February Street/Building 4 (Renaissance square), ☎ +374 47-949400, e-mail: info@armeniahotel.am. Offers international standards with 55 guest rooms. On-site restaurant, pool with sauna and conference hall. From 26,000 dram for single room. 39.82735746.7720282 Hotel "Nairi", ☎ +374 47971503, +374 47971502. Outside the city center, this hotel offers a relaxing atmosphere. 39.81247546.7500614 Park Hotel "Artsakh", 10 Vazgen Sargsyan Street. In downtown, offers all the conveniences of an high-end hotel. Has a restaurant, lobby bar, summer café, souvenir shop, business centre, library and conference hall. Change point, ATM and international telephone line are also available. Prices from 20,000 dram. The tourist office kiosk is located opposite to the parliament building in the 20th February street/Renaissance square. They offer many nice brochures with information about the main attractions. Website. There are several spots with free WiFi. These spots are in parks and around sights and monuments. Look for the signs of WiFi from Karabakh Telecom. There are several Internet cafés in the city and also the restaurants offer free WiFi. The locals are friendly and helpful towards foreign visitors. Anything can be discussed freely, including the war and current events. But you should always have a valid visa and keep your distance from the line of contact. Shushi is a great place to go and has a lot of traditional Armenian homes and churches. [LShushi contains many Armenian cultural monuments, while the surrounding territories include also many ancient Armenian village. The city is walled and has many historical churches and also has a few mosques, which are no longer operating. However, tourists are welcome to go in and see them. Shushi was the zone of one of the most famous battles during the Karabakh war. Agdam is also a very good place to see. It is an abandoned city, which is not a common site. There are thousands of old houses, but no one lives there. There is an old mosque there as well. Visitors are welcome there. Tour guides will be welcomed to take people. Gandzasar Monastery and Cathedral of St. John the Baptist is the most spectacular historic monument in Nagorno-Karabakh. It represents a wonderful masterpiece of old Armenian architecture, erected in 13th century. It should be seen by every tourist who decided to visit Nagorno-Karabakh. Gandzasar is located on the hill top, in the vicinity the Vank village, about 60 km distant from Stepanakert. The marshrutka line 205 run from Stepanakert to Vank twice a day 09:00 and 15:00. It returns from Vank at 14:50 and costs 600 dram (March 2015); besides you can arrange a taxi. This city travel guide to Stepanakert is a usable article. It has information on how to get there and on restaurants and hotels. An adventurous person could use this article, but please feel free to improve it by editing the page.